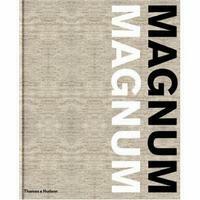 Издетальство Thames&Hudson выпустило в свет книгу "Magnum Magnum" в 2007 году. Она на 568 страницах, у нее твердый переплет. Автор издания Brigitte Lardinois. Книга выпущена в серии - по цене 4559.00 рублей. ISBN номер 978-0-500-54342-9. "Magnum Magnum" celebrates sixty years of the vision, imagination and brilliance of Magnum Photos, the legendary photographic agency and co-operative. A book of unparalleled scale and ambition, it features over 400 photographs by Magnum's members, from the acknowledged greats of photography in the 20th century - among them, Henri Cartier-Bresson, Robert Capa, Eve Arnold, Marc Riboud and Werner Bischof - to the modern masters and rising stars of our time, such as Martin Parr, Susan Meiselas, Alec Soth and Donovan Wylie. Each photographer is represented by six of their works as chosen by, and including a critical text by, another member.Including an introduction by the renowned historian Eric Hobsbawm [TBC], biographies of the featured photographers, a history of Magnum Photos by Brigitte Lardinois and a bibliography of Magnum books, "Magnum Magnum" will be the photography book of 2007 and will become one of the great collectibles of our time - an essential book for anyone interested in photography or the world depicted by it..